If you want to take on the absolutely mammoth task of completing Red Dead Redemption 2, then finishing all of the story missions is just the beginning of your journey. Beating the whole game also means hunting down all the legendary animals and fish, finding a ton of collectible items, finishing a wide variety of challenges, and much much more. We've tried to make things a little easier for you, by listing all of the tasks required to reach Red Dead Redemption 2 100% completion. Don't be trying to take shortcuts by applying any Red Dead Redemption 2 cheats though, otherwise your progress won't count and you'll be locked out of any trophies or achievements too. Complete all story missions. Check out our complete Red Dead Redemption 2 guide for the Gold Medal requirements, though these aren't required for 100%. You'll need to find and complete 10 Stranger missions across the Red Dead Redemption 2 map - indicated by grey question mark icons - and complete them. There are more than 10 Stranger missions available in the world, but you only need to do this many to tick off this section of the Red Dead Redemption 2 100% completion guide. If you're looking for help, these are the best Red Dead Redemption 2 strangers. Bring in five sheriff's bounties. Start the missions by collecting Bounty posters, which are marked on your map. For this section it's all about engaging in 25 Chance Encounters, which are those emergent stories that you'll run across as you explore the world. They'll appear as little grey dots on the map, and you'll usually hear them shouting for help as you run past. This one is quite interesting as it requires you to encounter one - yes, just one - Gang Ambush. The task reads that "Dutch's gang isn't the only one East of the Grizzlies. Others are out there and they don't take too kindly to new competition or old rivalry." Better keep your finger on that trigger. There are six remaining gang hideouts where the last few outlaws are holed up. You've got to find them, and capture the hideouts - one way or another. Every now and then it pays to stop and pay attention to your surroundings, and that's exactly what this one needs. Find just one of the many Points of Interest in Red Dead 2's world and you'll have ticked this one off, probably by accident. This is a gorgeous world after all. There are a total of nine graves around the map to mark your fallen companions, and you'll need to visit them all. Follow our Red Dead Redemption 2 graves locations guide for all their locations, but you won't be able to finish this task until the Epilogue. Although there are actually 12 complete cigarette card sets to find in the world of Red Dead Redemption 2, you only need to complete one to tick of this section of the 100% Completion Guide. Easy, right? We've got the full details in our Red Dead Redemption 2 cigarette cards locations guide. Once you've found the Stranger mission involving paleontologist Deborah MacGuiness, this dinosaur bones achievement will pop up. The problem is though, that there are 30 dinosaur bones hidden across the map, and there's no easy way to find them - unless you use our Red Dead Redemption 2 dinosaur bones locations guide, that is. Another collectable connected to a Stranger mission is the Legendary Fish. Jeremy Gill will ask you to find 13 Red Dead Redemption 2 Legendary Fish, which you'll have to mail to him in order to help complete his collection. In Chapter 4, you'll meet a Stranger named Algernon Wasp, who will give you a number of lists of exotic items to find. Somewhere in Big Valley is a rather odd fellow called Francis Sinclair. He needs your help locating 10 strange Red Dead Redemption 2 rock carvings (or rock faces as they're called in the Log) that are hidden across the world. Apparently when you locate them every one "maybe all will become clear". You'll find hunting requests displayed in train stations and post offices, and must complete five of them here. Note that you won't be able to take on the fifth and final request until at least Epilogue 1 in the story. You'll find various Treasure Hunters around the world, who will give you maps to various buried loot. But you'll only need to follow the clues to complete one Treasure Hunter chain in order to tick this off your list. Hidden away in the branches of the trees of Red Dead's world are rather eerily beautiful Dreamcatchers. There are 20 in total to find, and thankfully they glow gold in your Eagle Eye vision lurking amongst the foliage. Find all 20 Red Dead Redemption 2 dreamcatchers, note their positions and apparently there's an Ancient Secret to discover. There are actually 178 animal breeds to discover across the Wild West, from birds and rabbits, to horses and cattle, and everything else in between. But for this particular section of the Red Dead Redemption 2 100% Completion guide, you only need to discover 50, which you can do by 'studying' any new ones you come across in the world. Check out our Red Dead Redemption 2 animal locations guide for help finding different species. From your camera to your binoculars, Arthur Morgan loves his gadgets. And it turns out you'll need to obtain 10 different pieces of equipment to satisfy this particular requirement, so get collecting. An outlaw is more than the gun on his back after all. Turns out that along with 50 different animal species, you'll also need to discover 10 individual fish types in order to tick this one off your list. Just prepare yourself for getting your chaps wet. Although Red Dead 2 is set at a point in history when outlaws are dying out, there are still plenty of rival gangs to encounter. Six, in fact. You'll need to get up in the grills of all of them, and you can track your progress using the Gang section of your Compendium too. Oh, I take it back, horses don't count towards your animal discoveries. They're a whole separate shebang. Discover 10 of the hooved beasts on your travels, and you won't have to worry about studying a horse ever again. Along with the animals, there are herbs and other plants to collect and discover across the map. You'll need to discover 20 (out of a possible 43) to complete this section. Although there are actually 59 weapons to check out in the game, you only have to use 48 for this section, which means you can pander to your own gameplay preferences a bit. You can check out how many you've discovered and which ones in the Weapons sections of the Compendium. This one pretty much does what it says on the tin, as you just need to max out your health, stamina and dead eye to tick this off. You can do this by just playing the game, as doing various activities - like hunting, running, and fighting - will all slowly increase all three stats until you reach the max. There are several shacks that you can find in the game that are described by Rockstar as "unremarkable structures, but each with their own strange secret to hide". You'll need to find five of them to unlock this task. Why discover just any old animal when there are, wait for it, legendary animals to be found, and hunted, and skinned of course, too. 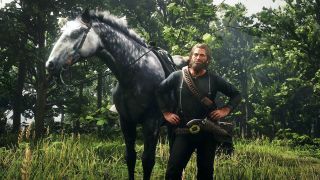 You'll need to track down and kill five of these Red Dead Redemption 2 legendary animals to cross this off. Why not make a hat of them while you're there. A cheeky way to win some easy cash in Red Dead 2 is to do a bit of gambling, and helpfully it also contributes towards your 100% completion. You'll need to play one game each of Poker, Dominoes, Five Finger Fillet and Blackjack in order to complete this section, but that should be easy enough, especially as table game locations are marked on your map. Aside from your Chance Encounters, Strangers and main story missions, there are also some oddities that you'll find loitering in your world that fall under this Ranters, Ravers, and Campaigners header. You'll need to find and interact with five of these characters to complete this part of the guide. Pretty much self-explanatory this one, but in order to 100% complete Red Dead Redemption 2 you need to take a bath. You stinky Pete. A number of 'reputable establishments' let you take a long hot soak to rest your aching bones and scrub away all that dirt and debauchery. All you need to do is take one single bath in all your time in the Wild, Wild West and you'll never have to think about getting clean again. Over in the Imperial Theatre in Blackwater, or the Fontana Theatre in Saint Denis you can catch a show, which will satisfy this particular requirement of the 100% completion guide. Or you can check out J.J. Riggins' Traveling Magic Lantern Show in Valentine if you want to get this section done quick. Slightly different from the shows mentioned above, if you head to Saint Denis' Theatre Raleur, you can watch a vaudeville show, which is described as for "the curious and the degenerate". Sounds amazing. You'll be able to watch escape artists, fire eaters and snake dancers galore, and you only need to do that once to tick this off the list. Eating, drinking, swigging tonics and more is just part of your daily survival in Red Dead Redemption 2. But you don't always have to buy them or swipe them off a corpse. You can get recipes and make them yourself at your various camps. For this section you have to craft one cooking recipe, one tonic, one type of ammunition, one hunting item, one horse care item, and one weapon.